Beautifully made mouthpieces crafted in England. Designed by the finest British players. Modern brass at its best. Alliance Brass manufactures a complete range of mouthpieces for soprano cornet, cornet, trumpet, flugelhorn, tenor horn (USA: alto horn), baritone, trombone, bass trombone, euphonium and tuba. All these mouthpieces are developed for the needs of the modern player. Some of the finest musicians in the world today have contributed their expertise to make a range ideal for every level of brass playing. Mouthpieces are crucial in determining the sound, response and intonation of a brass instrument. It is critical to have a mouthpiece that produces a consistent tone at all dynamic level and in all registers. 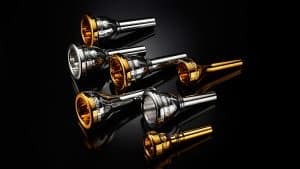 Our mouthpieces have been carefully designed to produce the powerful and rich sound that all brass players seek and are made in the United Kingdom with the latest CNC technology, polished and finished to the most exacting standards. They are available in both silver plate and in the strikingly beautiful finish of silver with a gold plated cup and rim. In addition, the Signature Line mouthpieces are available in luxurious and hard-wearing gold plate. Alliance also produces the famous Eco-Lube range of pro-quality lubricants for brass instruments, including the Eco-Lube Pro-Quality Valve Oil and Eco-Lube Pro-Quality Tuning Slide Gel. All Alliance mouthpieces are made in the United Kingdom with the latest CNC technology and are polished and finished to the most exacting standards. All our products are based on our knowledge, craftsmanship and experience that help create our reputation for excellence. All Alliance products are available to order online from this website through a secure ordering system. Your order will be carefully packed in the factory and shipped directly to you wherever you are in the world. Our mouthpieces are also available in stores in many countries. All orders are promptly fulfilled from our stock and shipped by reliable mail services. Log in to My Account and track the progress of your delivery. Customers in the United Kingdom can expect delivery in 2-3 working days.